butter or refined coconut oil for cooking (I prefer refined to unrefined for cooking as it has a higher smoke point). And you’ll need a well-cared-for, non-toxic, non-stick pan. Combine all the ingredients to make a smooth batter (I find it comes together best when I use my electric hand beater). Heat some butter / coconut oil in your pan, on low-medium heat. Spoon in mixture to whatever size. Warning: they will cook quickly! So cook them on a lower heat and keep your eye on them. You want to avoid too much colour, and you definitely don’t want them burnt. Flip them as soon as they’re slightly golden. Obviously you can double or triple the recipe. It’s great to make a couple of day’s worth of mixture and have it on hand in the fridge so it’s ready to grab at breakfast (or anytime of the day). The mixture will get thicker the longer it’s left, so if it’s too thick just whisk in an extra splash of milk to thin it. nutrition numbers: Although I could easily eat a whole batch, half of this recipe makes enough for a (more conservative) serving for one, and provides about 19g of protein, 30g of carbohydrates and 3g of fat (with additional fat from the fat you cook them in), as well as (among other micronutrients) a hefty 560mg of calcium … a good portion of a healthy 2000mg daily quota. 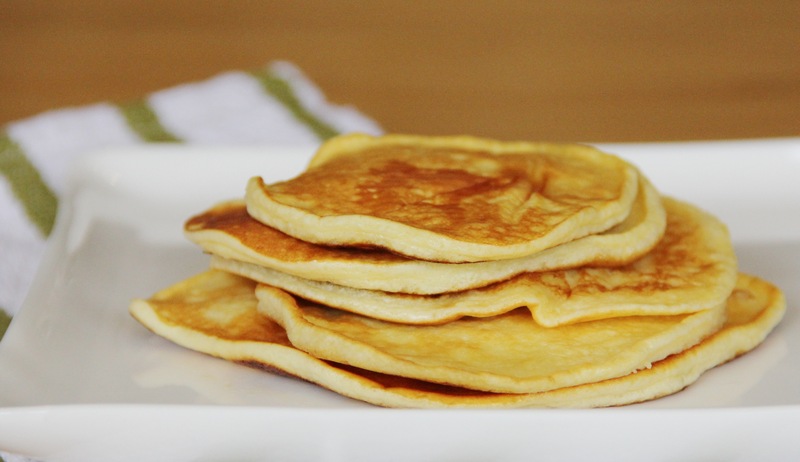 variation: Ricotta Hotcakes – Just add 1/3 cup ricotta and the zest of half a lemon into the mixture. I like Danny Roddy‘s version too. His recipe here. Disclaimer: My posts are not meant to be individualised treatment plans, protocols, etc. I share what I research and use, and that is it. They are meant to spark thought based on the normal anatomy, physiology and biochemistry of the body. The information contained in this blog should not be used to treat or diagnose disease or health problems and is provided for your information only. Why is nonfat okay to use? I’ve had several queries regarding concerns about powdered milk. Thanks for your comment. See it as an ingredient that can be used to replace grain/nut flours and for adding Calcium, not as a replacement as such for fresh milk. Fresh is always best of course. Skimmed milk powder is preferred because it’s the fat component that contains the majority of the sterols / cholesterol. Determination of cholesterol oxidation products in milk powder and infant formulas by gas chromatography and mass spectrometry. Przygonski K, Jelen H, Wasowicz E.
In this paper a method for the cholesterol oxidation products (oxysterols) determination in milk powder and infant formulas has been presented. In the sample preparation step lipids transesterification has been performed. The recoveries of oxysterols have been determined and ranged from 94.2% to 99.9% for all but 20a-hydroxy cholesterol (74.2%). Detection limits were 0.018-0.034 ppm and the relative standard deviations (RSD) values were 4.6%-18.3%. The method has been utilized for the determination of oxysterols in milk-based infant formulas and milk powder available on the market. The concentration of oxysterols was between 0.04 and 4.20 ppm of a lipid extract fraction. B. D. SANDER, P. B. ADDIS, S. W. PARK, and D. E. SMITH (1989) Quantification of Cholesterol Oxidation Products in a Variety of Foods. Journal of Food Protection: February 1989, Vol. 52, No. 2, pp. 109-114.